Flight Attendant Pet Peeve #5 – You are still here? I’m wearing the blue polyester dress, you know the one, and I’m standing two rows behind you, an arm draped over a seat, a hand gripping the plastic handle of my Travelpro bag. When the lights are turned to bright, I turn around and look at my coworker, and without uttering a word, our eyes say everything that can possibly be said. Finally you step into the aisle, look at me, and then smile, so I smile at you, and while I’m smiling I watch you dig around inside three different seat back pockets. “Thanks for a nice flight,” says a voice over the PA, and just like that the voice is gone, along with the rest of the passengers, and crew. It’s just me, my coworker, and you. THE ME FIRST PASSENGER: Jumps out of the seat before the seat belt sign has been turned off. If there are other me first passengers standing in the aisle, they will push each other out of the way in order to be the first me first passenger off of the airplane. Don’t you know the first one on should always be the first one off, even when he’s sitting in business, not first. 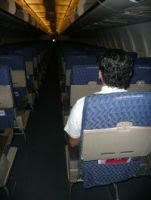 THE NORMAL PASSENGER: Waits patiently in the seat until the passengers sitting a few rows ahead stand. At this point the normal passenger gathers their belongings, and when the time comes, steps into the aisle, grabs the suitcase out of the bin, and begins to walk to the front of the airplane, not once breaking the rhythmic deplaning flow. Thankfully most passengers are normal passengers – when it comes to getting off the airplane. THE I’VE GOT ALL DAY (AND NIGHT) PASSENGER – I do hope this is not you. Granted, you are very nice, and quite polite, a dream passenger really, and I did have a wonderful time talking to you in the galley, but the time has come to say goodbye, so buh-bye. Adios time. Look, it’s not forever, we can do this again, but at another time, on a different flight. So go, please, now! No offense, don’t mean to be rude, but the layover is short! I’m the me first passenger most of the time, flew London to Geneva too many times not to be.